Overview - A young man, falsely imprisoned by his jealous "friends," escapes and uses a hidden treasure to exact his revenge. Amongst all the many possible motivations for a character, is there really a more powerful drive than pure, unfettered vengeance? Is there a call to action that can more decisively get an audience behind a protagonist's journey, than revenge? Indeed, throughout all of fiction, retribution is a commonly reoccurring force, propelling narratives to often bloody and tragic ends seeped in moral uncertainty. 'The Count of Monte Cristo,' is such a story, and its enticing adventure and deep themes have fueled several retellings and imitators over the years. From director Kevin Reynolds, the 2002 film adaptation takes the core of the novel and turns it into an entertaining and occasionally exciting Hollywood production. Unfortunately, despite several strengths, the movie still features some clunky editing and underdeveloped themes. Based on the Alexandre Dumas classic, the story follows Edmond Dantes (Jim Caviezel), a kind but naïve young man who wants nothing more than to marry his beautiful love, Mercedes (Dagmara Dominczyk), and live a nice, quiet life. Unfortunately, jealousy fuels tragedy, and after being betrayed by his best friend, Fernand Mondego (Guy Pierce), Dantes is falsely imprisoned for treason. Ignited by a thirst for vengeance, Dantes hones his skills and eventually escapes. Forever changed by his hardships, the once unimposing man transforms himself into the dashing and enigmatic Count of Monte Cristo. Now possessing the means and know how, he plots to systematically enact swift vengeance on those that ruined his life. Though it shares many core aspects with the celebrated novel, the script is a pretty basic Hollywood filtered adaptation, simplifying the dense work into a traditional two hour, three act structure. While some big fans of the book might balk at all the changes, the results are still entertaining and though the alterations can be a bit too simplistic at times, they are understandable. This is meant to play like a sweeping adventure, full of action, romance, impressive costumes, elaborate sets, and exciting set pieces, and on that front it mostly succeeds. Director Kevin Reynolds brings a nice level of competency to the proceedings, and stages many of the sword fights and action scenes with some welcomed visual thrills. The performances from the cast are also a highlight, and Caviezel's gradual transformation comes across as believable and emotional. When he finally becomes the Count of Monte Cristo, friends and enemies from his past no longer recognize him. While this at first seems rather unrealistic, the reality is that Caviezel's dramatic changes in demeanor and more subtle alterations in appearance, do make the man almost unrecognizable. It's his performance that ends up selling this plot point, and in the hands of a lesser actor the film itself may have unraveled. Pierce also does a respectable job as the villainous Mondego. The character can come across as pretty one-dimensional, but the actor brings a certain intensity and respectability to the role that compensates for a lack of development. Dagmara Dominczyk does a wonderful job as the gorgeous Mercedes, and her scenes with the Count effectively reveal the heartbreak and pain that led to some seemingly shameful decisions from her character. For the most part, the script and direction do an adequate job, but there are indeed some stumbles throughout, usually related to pacing. The first third of the film feels a little clunky in structure and editing, and several plot points, like Dantes and Mandego's friendship, are never fully realized. This is understandable, as it really is a lot to try and cram into two hours, but it still feels undercooked. The Count's eventual vengeance also feels pretty rushed, and it would have been nice to spend a bit more time with each of his victims. Going along with some of the structurally awkward aspects of the film's early scenes, the climax suffers from some clumsy staging and editing as well. The mixture of heavy exposition right in the thick of action clashes, and there is just an overall lack of finesse. On a thematic level, though the movie deals heavily with the ideas of vengeance and forgiveness, its examination of these concepts is disappointingly superficial. The source material is ripe for insightful commentary and character work, revealing the heavy toll that hate and revenge take on the soul, but the film sort of loses focus on these concepts in favor of more traditional dramatic beats and resolution. The director even admits to this lack of depth in the included commentary, and while his reasoning behind the picture's comparatively shallow subject matter is understandable (it has to do with pleasing a mass audience) one still can't help but feel like a more powerful and well rounded movie could have been made. 'The Count of Monte Cristo' is not without its flaws, but the core of the script is strong and the story itself is timeless. Led by some solid performances and exciting set pieces, this adaptation of Dumas's literary classic might be light on depth and insight, but thankfully it succeeds in broader strokes, providing an entertaining and worthwhile experience. 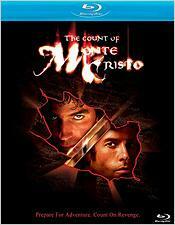 Touchstone brings 'The Count of Monte Cristo' to Blu-ray on a BD-50 disc housed in a standard case. Some skippable trailers play upon start up before transitioning to a motion menu. The packaging indicates that the release is region A, B, and C compatible. The movie is presented in a 1080p/VC-1 transfer in the 1.85:1 aspect ratio. While there are some nice sequences, this is an unfortunately uneven and predominantly murky transfer. The print itself is in good shape with no major signs of damage. A very light layer of grain is visible periodically, though there is also some noise present, particularly in shots of the sky. The first half of the movie features many scenes set at night or in low light conditions, and this portion of the film take on a predominantly dim and dark appearance. Shadow detail is often crushed and the overall image suffers from fairly low contrast levels that lack intensity and offer a washed out, flat appearance. Still, detail can be good throughout, but the video has a relatively soft appearance. Once we finally escape the drab, dirty dungeon in which Dantes is held captive, the movie starts to looks much better, and features more brightly lit and dynamic sequences that offer a bit more pop. Colors in these scenes feature some strong saturation and while contrast remains too low, there are some instances of depth. Still, despite a stronger second half, the image is never exactly impressive. Though some scenes look stronger than others, this is a predominantly mediocre presentation. The elaborate sets and production design are certainly praise worthy, but as depicted here, lack contrast and substantial pop. This is an acceptable transfer, but not much more. The movie is provided with an English DTS-HD Master Audio 5.1 track and a Spanish Dolby Digital 2.0 track with optional English SDH, French, and Spanish subtitles. While a little more impressive than the video, the audio still leaves a bit to be desired. Dialogue is clear and full but there is some minor crackle here and there. The track is surprisingly front heavy, and while there are instances of robust surround usage and directionality, they're isolated and infrequent. With that said, certain set pieces do sound good, momentarily coming to life with an enveloping soundscape that offers clanking swords and exploding fireworks with nice fidelity and deep low end. Dynamic range is decent, and there is no major distortion among the frequencies. Balance between the elements is good, and dialogue is always easy to make out. For an adventure film, the soundtrack is decidedly mundane. With that said, there are still some immersive and exciting moments, I just wish the track was more consistent. Touchstone has included a decent set of supplements, including a commentary and some additional material. All of the special features are presented in standard definition with Dolby Digital 2.0 sound and optional English, French, and Spanish subtitles. Commentary with Director Kevin Reynolds - The director provides a pretty interesting but slightly subdued track. Reynolds gives a very candid discussion of the film and points out many problems and challenges he faced while making the movie and admits to some shortcomings. Locations, sets, casting, the adaptation process, editing, and various technical bits are all touched on, giving a pretty comprehensive view of the film's production. It's refreshing to hear a filmmaker own up to some mistakes and Reynolds does a decent job of keeping the track interesting and insightful throughout. Deleted and Alternate Scenes (SD, 22 min) - Five deleted scenes are included here and are available to watch separately or together. An introduction by the director and editor is included before each sequence that explains why it was cut. While nothing here is all that interesting, these bits do help to flesh out some of the supporting characters and plot developments, and one alternate scene presents a darker tone for the movie. The most substantial inclusion is the alternate ending duel which shows a previous version that had to be reshot. Even more clunky than what's included in the movie, it's a good thing they replaced it. An Epic Reborn (SD, 34 min) - Four featurettes are included here and are available to watch separately or together. The first segment discusses author Alexandre Dumas, the second details the screenwriting and adaptation process, the third provides a behind-the-scenes look at the movie's production design and sets, and the last gives us a peek at the stunt and sword choreography. Each of the featurettes is pretty interesting and some of the screenwriter's insights and reasoning behind certain changes are definitely worth hearing for big fans of the book. En Garde: Multi-Angle Dailies (SD, 3 min) - A split-screen version of the final duel is included, that features dailies from the two-camera set up used. Director Kevin Reynolds provides commentary over the material that explains the benefits and drawbacks of shooting two angles simultaneously. Layer-By-Layer: Sound Design (SD, 5 min) - The prison escape scene is included here with four separate audio tracks that can be toggled with the audio button on your remote. The tracks present the composite as heard in the film, and isolated mixes for the dialogue, music, and effects. While not the most entertaining feature, it is interesting to see how much each audio element adds to the proceedings. 'The Count of Monte Cristo' is a pretty basic but entertaining adaptation of the classic novel. Though its examination of revenge is pretty thin, the film's performances, set design, and action make for a worthwhile effort. Video is fairly uneven and lacks pop, and the audio mix is solid but fairly front heavy. Supplements are interesting, rounding out a decent but not impressive disc. Worth a look.